Create your a special piece of greek jewelry you will have for a lifetime! 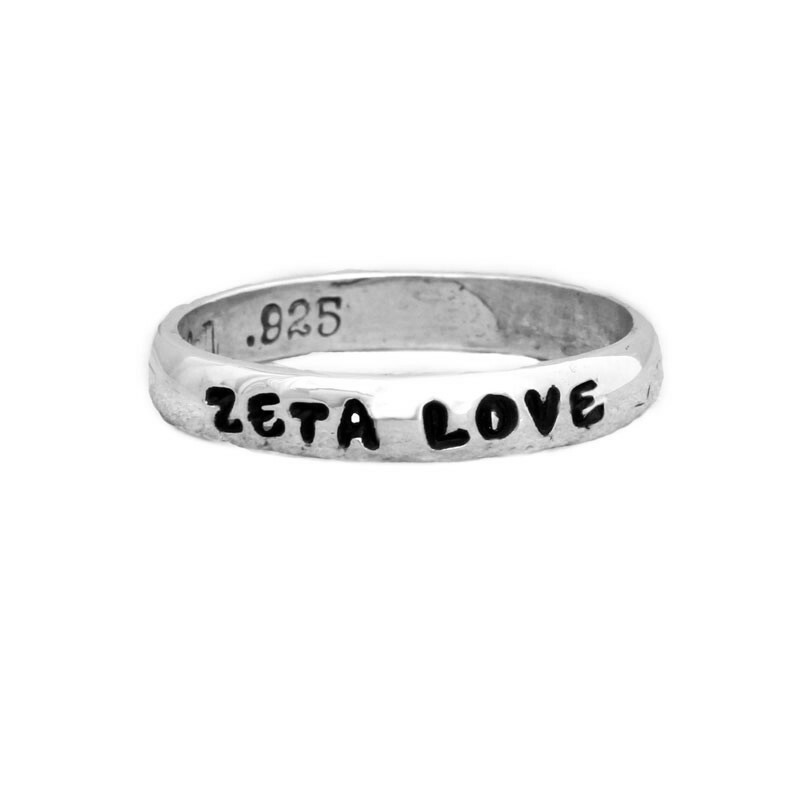 Stamp your love for Zeta on the personalized Zeta Tau Alpha Sorority Single Ring! have it gift wrapped in our signature lavender and rosebud packaging! Pledging a sorority is one of the most exciting times of a young woman's life. Our Zeta Sorority Rings celebrate the sisterhood forever! Stamp your name, the Zeta Tau Alpha greek letters, Zeta, Zeta Love or anything you can imagine on the band to create a keepsake you can admire for a lifetime. Dimensions: The sterling silver bands are approx 3mm wide and can be stamped with up to 12 characters/spaces. Sizing: When determining your size, we ask that you give us a size that is a snug but comfortable fit. If you are unsure of your size, you can order a ring and select the option for ring sizer from the dropdown and we will send you a ring sizer and instructions on how to send us your size. Sorry ~ we cannot stamp on the inside of the bands. Prices include stamping. Because this item is customized all sales are final. We only use sterling silver in our products. This gift can be wrapped in our signature lavender and rosebud packaging. So whether it is a gift for you or someone else, the surprise you get when you open the box will make you smile!